The VEX 75 MHz Control System is the former competition control system. Robots are controlled by a transmitter with different radio frequency crystals. Controllers can be tethered to one another to allow for a second driver. This system is no longer legal in the VEX Robotics Competition. We recommend the current VEXnet control system. 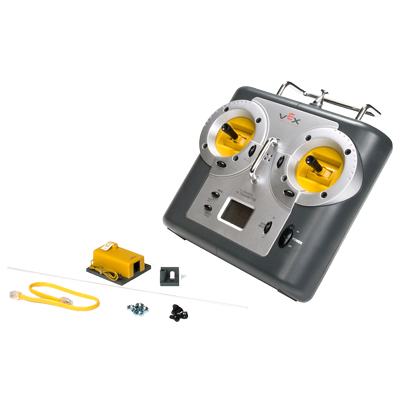 This kit includes a VEX EDR 75 Mhz Transmitter and Receiver. 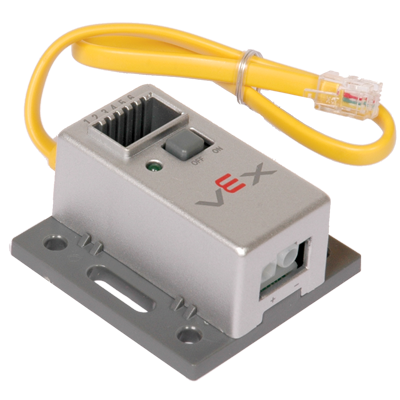 It provides the radio control link which allows human operators direct control of a VEX EDR robot. Transmitter is a 6-channel (4-analog, 2-digital) hobby grade FM unit, custom configured for VEX. 6 Input Channels (4-analog, 2-digital). 75Mhz, multi-frequency via RF crystals. 10 Channels. Two transmitters can connect to one robot. Multi-configuration with digital trim and channel mixing. This Signal Splitter can be used to drive up to (6) PWM devices, including VEX EDR 2-Wire Motors with a Motor Controller 29 & VEX Servos. Since this device is capable of directly taking the signal output from the VEX EDR Receiver Module and driving motors, it is possible to build robots without a VEX Microcontroller. Analog Channels = 2 potentiometers, each with an X and Y axis.